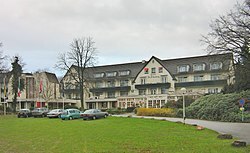 The Hotel de Bilderberg is a hotel in Oosterbeek in the Netherlands where the Bilderberg Group first met in the 1954 Conference. The hotel gave its name both to the Group and those who participate in its activities (Bilderbergers). It is owned and operated by the Bilderberg hotel chain, which runs 20 hotels in the Netherlands. This article about a Dutch hotel or resort is a stub. You can help Wikipedia by expanding it. This page was last edited on 3 April 2016, at 13:27 (UTC).